If only we would all get along as well as the birds I’ve been watching this month at the heron rookery. In early March the Canada Geese were busy checking out the various nests in the rookery, apparently staking their claims to the choice spots. It’s hard to imagine how the little goslings manage to survive the leap from these high nests, but apparently some do, since I’ve seen the geese nesting there for many years. Each year I’ve been sure that there will be fights when the herons return, but if there are, I haven’t seen them. The geese and the herons just seem to enjoy hanging out together. Actually, the herons spend more time fussing with each other than they do with the geese. These two were sparring with each other for the better part of an hour, until one finally got tired and left this prime perch to the winner. But it’s not just geese and herons sharing this real estate. Remember the Great Horned Owl I’ve been seeing this winter? She’s decided that the rookery is a dandy place to nest as well! I’ve been watching her for weeks, always keeping an eye out for her mate. I’ve been scanning the surrounding trees every time I go to the rookery, but no luck. Until yesterday. Finally! Probably been on that same branch the whole time. Imagine you’re a big old Yellowstone grizzly bear who’s just woken after your winter sleep. Food. You need food. Now imagine that you’re lucky enough to be wandering around the Blacktail Ponds in Yellowstone on an early spring day, and you discover a bison that fell into one of the ponds this winter and couldn’t get out. Score! He’s thawing out, and he’s yours! You drag him from the water, and eat your first good meal in months. It’s hard work, this scavenging for dinner, so you cover up your prize and lay down for a bit of a snooze. But something wakes you up. Dang, you’re not alone. Oh, jeez. It’s that danged coyote. Just keep working. They’ll leave. Good grief. Now an eagle? Not fair. At least the coyote is helping. He doesn’t want the eagle there either. Lordy, this is dirty work. Gotta clean these paws. (Postscript): Mr Grizzly eventually had his fill – for the time-being anyway – and left the carcass. Later that afternoon the coyotes came in, one by one, and they and the ravens had quite a feast. Not sure if the young eagle ever got a share or not! Once upon a time, in a small woods on the edge of a big pond, there lived a wise old owl and a curious young fox. The owl, who had lived in the woods for many years, knew that he should only come out at night. He wanted to see what was happening in the woods and at the nearby farm, but it wasn’t safe. 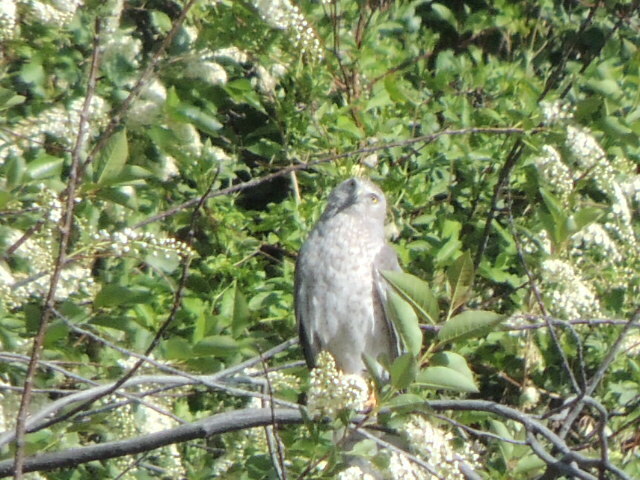 So during the day he stayed perfectly still, hidden in the branches of a gnarly old cottonwood. He was hidden so well that people, and dogs, and yes…even foxes….walked right by him without a clue that he was there. Every so often he’d move into the open – just a bit – and calmly look down on the activity below him. And the fox? Well, the fox couldn’t resist. He wanted to know what was going on in his woods, and over at the farm, and out on the frozen pond, and he trotted all over the place, leaving his marks everywhere. He was curious, that’s for sure, and when a visitor spied him on one of his jaunts he stopped and stared right back at her. And when she followed his tracks and found him at his den, he was just as curious as she was. He finally decided that he should go into the woods, away from this strange creature. But his curiosity got the best of him and he just had to come back and give her another look. The visitor saw him the next day, as well, when he was sharing his breakfast with a new friend. Even the wolves are waiting, off in the distance beyond the trees. It’s a death-watch. We’re all watching a wounded bull elk, waiting to see what will happen next. He’s bedded down in a patch of willows in the Lamar Valley, and he’s been there for days. Three days earlier the Lamar Canyon pack chased him, and one of them caught him on his hind end, wounding him. Coyotes circle the elk, but don’t come too close; he’s still dangerous. We can just see his antlers sticking up above the brush. One wolf comes closer, accompanied by a greedy raven. But he retreats back behind the trees. We join the waiting wolf-watchers. It feels morbid, but none of us want to look away. Late in the afternoon another bull elk appears over a ridge. He seems to know that his comrade is in trouble below him, and he beds down on the ridge to join the wait. The sun is sinking, and it’s getting colder by the minute. Eventually the wolf-watchers leave, and we’re left alone with the coyotes and the eagles and the wolves…watching and waiting. And…as darkness falls, the elk is still hanging on. We can’t come back in the morning, so this is one nature drama that we’ll have to leave unresolved. (UPDATE): I checked Yellowstone Reports, a wildlife blog that I subscribe to, and discovered that the elk hung on for nearly a week after we saw him. The Park Service moved the carcass because it was too close to the road, and the Lamar Canyon Pack finally got their meal. Seems like an appropriate time to re-post this. 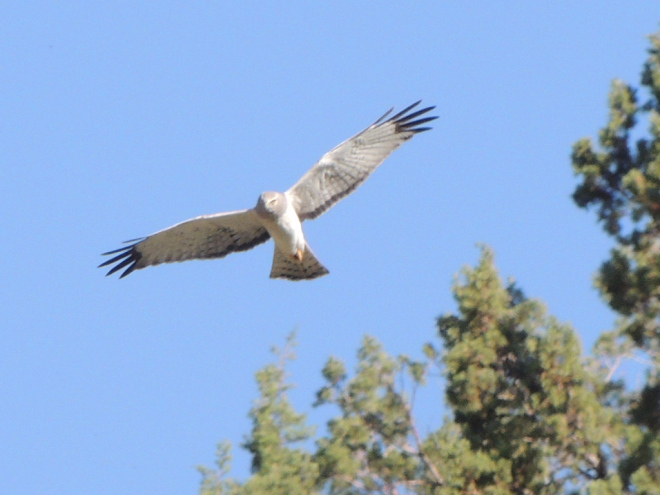 I’m standing on the edge of the Blitzen River, watching – and being watched by – a pair of Northern Harriers. I think they must have a nest nearby, since they don’t seem to like the fact that I’m hanging around. 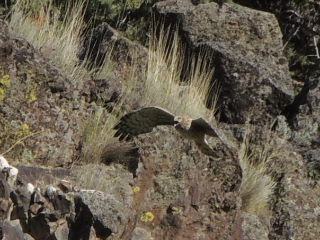 The female does a couple of fly-bys, checking me out. The third time, she is vocal in her displeasure: she doesn’t want me there. That spurs her partner into action. He screeches a response and circles me as well, giving me the evil eye on the first pass and diving at my head on the second. I swing my arms and he veers off, but I’m duly chastened. I get the heck out of there. We’ve hunted the wild Christmas tree nearly every year since 1983. We head into the National Forest, hunting tag in hand, and look for that perfect evergreen to bring into our house and remind us that there is still life under all that cold and snow. As with all hunting, there are rules. You don’t just go out and take down that beautiful lone spruce in the middle of a meadow. You want to find a nice congested batch of young trees that need some thinning. Take down one of those, and the surrounding trees will have a better chance. Which means that our Christmas trees usually are pretty Charlie Brown-ish, and we’ve often resorted to cutting extra boughs and drilling holes in the trunk to fill in the bare spots. Even so, we passed on this one – too many naked spots! The thing is, with all that snow on them, you can’t really tell what’s underneath. And when it’s really cold, the hunt is just plain torture. My first Christmas in Montana we headed out from our apartment – walking – on Christmas Eve. It was about a mile to the National Forest, and by the time we found our scraggly tree and turned back, I was just about hysterical from the cold. Head down, I trudged behind Bill, cursing Montana the whole way. We got into town, and the bank thermometer was slowly blinking: -36. I’m amazed I stayed. This year, though, was perfect. We’ve found a spot in the Elkhorn Mountains that burned in 1988, and the trees are filling in there way too thickly, so there are plenty of nice choices. The snow was deep, the temperature in the 20s, and we had a grand day. We snowshoed up the hillside, looking for a nice thick stand of trees. We have tall ceilings, so we can fit a tall tree. This year, we found a gorgeous one in the middle of a dense group of firs. We thanked the tree for letting us cut him, and were on our way. Merry Christmas and Happy Solstice, everyone!